Phew, 2nd day down...No-To-Rice (NTR) Mission is still on! But I'm still craving for others! OMG!!! 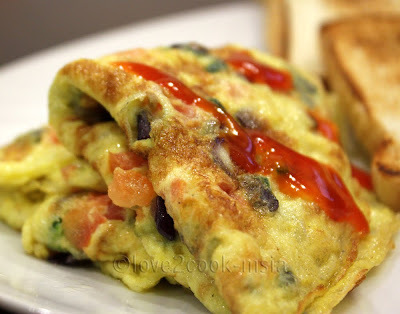 Initially, I wanted to name the dish as Tomato Omelette...but do U all know that Tomato Omelette is a breakfast dish in South India, and it contains NO EGG??? Wanna know more? Please google for it! 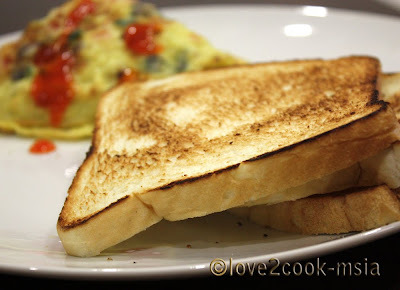 Recipe courtesy :~ MY HUBBY! Hubby made it for us during his last break...I just can't resist..but insisted for more! hahaha...and he was so sweet to make me a second helping! Missed U chello! Whisk egg together with all the ingredients above. Pour half of the mixture, covering the pan evenly. Let it cook, but make sure the underside of the eggs is not browning too much. Turn/flip the omelette upside down. Let it cook again. Now, fold the omelette in half and fold once more. Done! Repeat steps to cook the rest of the mixture. * U may also add some chopped parsley into the mixture. 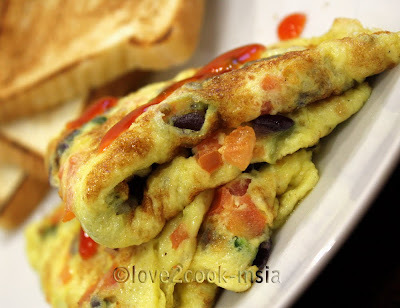 another delicious version of omellete!!! 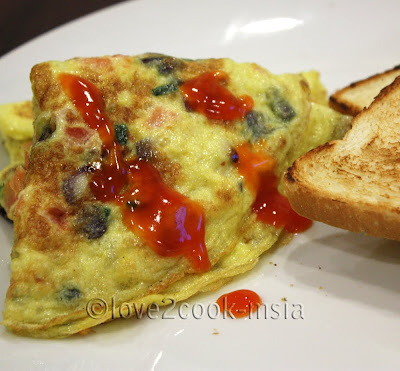 hai love..tq..sudi dengar pasal blog akak kat fuhyoofm...my hb also suker omelette..